Location: River Ex, Nr. Sidmouth Devon, GB, on her swinging Summer mooring. Aquasulis has been kept on the Rivers Ex and Dart for the last 10 years. In her present ownership she has been well maintained and is in good order. She has twin diesel engines sited under the central wheelhouse and there are two steering positions. She has generous headroom of 6ft 4ins throughout. There are two” head” compartments and a shower. Carvel construction of Iroko planking on Oak frames. The aft decks is laid teak. She offers comfortable accommodation for 6 persons. 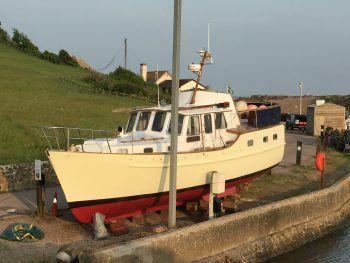 She has been cruised to the Scilly Isles, Northern Brittany and along the coast to Cowes, Isle of Wight. She is very manoeuvrable vessel with a capable and comfortable sea going manner. 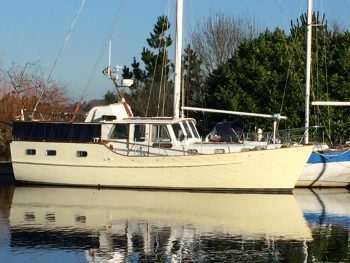 Construction: J.Francis Jones design built by Landamores of Wroxham, Norfolk. She has a relatively low air draft. Carvel wooden displacement hull with a long keel. Iroko planking on Oak frames. Wheelhouse amidships access in from both side decks. Exterior steering position from aft deck. Aft deck is laid with teak, side decks and fore decks are marine ply epoxied and painted grey. Deep covering board around the deck. Fore hatch from forward cabin. Engine Description: 2 x Perkins 4236 at 84hp each, diesel engines on flexible mounts. Freshwater cooled via heat exchanges. 4 cylinder. 2 x stainless steel shafts, 2 x triple blade bronze propellers. 2 x stainless fuel tanks capacity of 440 litres each. 6ft 4ins headroom throughout the vessel. Hot and cold water supply serving: 2 x wash basin, the galley sink and 1 x shower, aft. 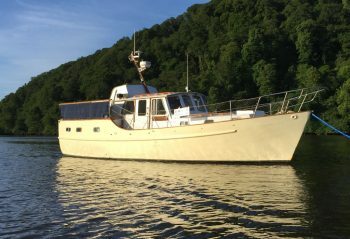 The wheelhouse/ saloon has the internal helm position with all the instrumentation, a full length settee berth ( pilot berth) another seat around a freestanding dining table/ chart table. Aft of the wheel house is the galley it has a Gas double burner with grill and oven. Stainless steel sink. 12v fridge with freezer. Large aft cabin with double berth with a removable single over plus a port side a single berth with another removable single berth over. Plenty of drawers and stowage cupboards wardrobes. Large opening hatch to aft deck. Forward the second cabin, 2 x single settee berths with drawers and lockers , opening port lights. Forward heads compartment has a fore hatch, a sea toilet and washbasin, in fore peak. Varnished slating on the cabin sides. All cabins clean and well painted out. All carpets and curtaining to remain. Pair of stainless steel davits on the aft deck. Canvas dodgers around the aft deck. Deck stepped varnished wooden signal mast . Incastec echo sounder depth with repeater, speed and distance. DSC VHF Standard Horizon 1500k with repeater to the top deck. Wheelhouse: 1 x 4kg powder. Stanchions and guard wires surround the entire decks. Wooden handrails on the aft deck. Fixed grab rails to the coach roof. Gas alarm in galley. Gas supplied with a solenoid control switch.